The chemist’s first choice for heterogeneous catalysts is often porous silica because of its high surface area. However, these surface areas are mostly due to the pores and are thus not always accessible. We have developed new kind of fibrous silica nanospheres. Such a fibrous morphology observed in these nanospheres has not been seen before in silica materials. The material exhibits excellent physical properties, including a high surface area, a fibrous surface morphology, good thermal and hydrothermal, and high mechanical stability. Its high surface area is due to these fibers and not pores (see below figure). KCC-1 will be very useful for silica-supported catalysts, wherein accessibility of active sites can be increased significantly. As part of the Nanoscience and Catalysis group, we aim to improve the properties of KCC-1 by understanding its mechanism of formation as well as exploring for various applications in catalysis as well as for gas storage. Scanning electron microscopy (SEM) images shown in below figure (left) indicate that the KCC-1 material consists of colloidal spheres of uniform size with diameters that range from 250 nm to 450 nm. Close inspection of these images reveals that the material possesses dendrimeric fibres (angle shaped with thicknesses of 8-10 nm) arranged in three dimensions to form spheres, which can allow easy access to the available high surface area. 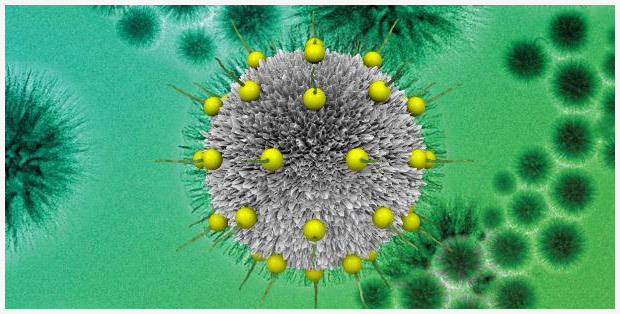 Further structural characterization of synthesized silica nano-spheres performed by high-resolution transmission electron microscopy (HRTEM) (figure-right) reveals well-defined and ordered fibers coming out from the center of the particles and distributed uniformly in all directions. This material was found to be very useful as a support for development of nano-catalysts such as Ru/KCC-1, Pd/KCC-1, TaH/KCC-1 etc and also as sorbents for CO2 capture. These nano-catalysts displayed superior activity which was due to the highly accessible active sites on KCC-1 support as compare to conventional MCM-41 support (see below figure). The catalysts were also stable with an excellent lifetime and no sign of deactivation, even after several days of reaction. This enhanced stability was due to the restricted Ostwald ripening and/or sintering of nanoparticles. due to fibrous nature of KCC-1.